The swimming hole just south of Manzanita Campground. A campsite at Manzanita Campground. Oak creek runs just below the campground to the left. 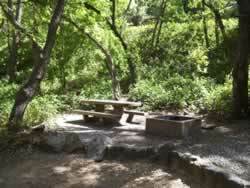 Manzanita Campground is located just south of Slide Rock State Park in scenic Oak Creek Canyon. 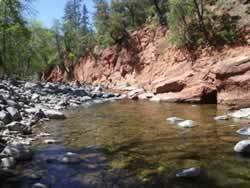 The campground is located right on Oak Creek. 19 campsites are small and some are now reservable. Come early and during the weekdays to have a chance at one of these prime campsites. The camp area is so small that there no room for RV's. Only one vehicle is allowed per site. Follow the river downstream a hundred yards or so and you will find a nice little swimming hole. No radios or amplified devices are allowed in the campground. Rainbow trout are stocked throughout the summer months and holdover trout bring anglers in year round. This is an excellent spot for pan sized hatchery trout. Manzanita is also located just a couple of miles north of a trout farm just in case the fish aren't biting or you want the little ones to catch some fish. 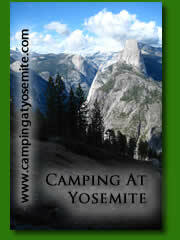 For further information see our Featured Campground section. Campsite Panoramas - See each campsite at Manzanita Campground. Click a campsite number below or a campsite icon on the map below. From Phoenix, take I-17 to Hwy 179, north to Sedona. Go north on Hwy 89A in Oak Creek Canyon 6 miles. 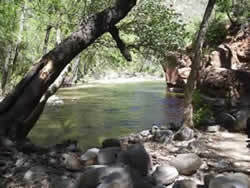 If coming from Flagstaff on I-17, take Hwy 89A south into Oak Creek Canyon 23 miles.